Are you one of the many thousands of people that have sciatica? Sciatica is a condition in which pressure or irritation is placed along the sciatic nerve. The sciatic nerve runs from the lower back down the backside of both legs and into the feet. 90% of the time sciatica is caused by a herniated disc putting pressure on the sciatic nerve. Symptoms can include pain, numbness, weakness or tingling. In order to fully understand sciatica and thus how to best treat it, we need to review some low back anatomy. The anatomy of the low back is very complex. There are a lot of moving parts and thus many things that can go wrong including the symptoms of sciatica. The low backbone structure consists of the pelvis and sacrum at the bottom as the foundation followed by 5 lumbar vertebrae stacked on top of each other that all sit on top of the sacrum and pelvis. The sacrum is the foundation of the spine of which the lumbar vertebrae sit on top of it. The sacrum is then connected to the pelvis of which your hips and legs then attach below. The lumbar vertebrae all have a cartilaginous disc in between each of them that allow the spine to flex and twist. 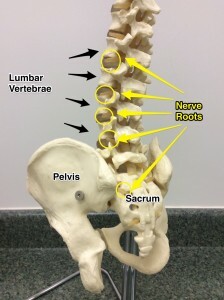 Also in between each vertebra is a place where nerve roots exit on either side of each vertebra. It is the irritation of the nerve roots of the lower lumbar spine and upper sacrum (tailbone) which cause sciatica. a) Facet joints – The facet joints are the most posterior joints connecting each of the five vertebrae including joining the fifth vertebra to the sacrum. Since these joints are located on the posterior side of the vertebrae, leaning back in extension will typically increase any sciatica pain caused by subluxation of these joints. 2. Disc problems – The discs located in between each of the vertebrae and in between the last vertebra and the sacrum can bulge or herniate. Each spinal disc has a gelatinous material at its center. Over time the walls of the disc can weaken and break down allowing this gelatinous material to push out (bulge) toward the outside of the disc. If the wall breaks and the material actually leaks out, this is called a herniated disc. The problem with a bulge or a herniated disc comes when the displaced disc places pressure posteriorly toward the nerve roots that are exiting on either side of the spine at any of the various levels of the vertebrae. This can cause not only low back pain but also pain down the leg as well. In some scenarios this issue can cause issues with organs because there are also branches coming off those nerve roots leading to the front of the abdominal cavity. In a worst-case scenario, there can be loss of bowel and bladder function. This is an emergency situation that might require a surgical intervention. 3. Muscle weakness or injury – Problems with the muscles of the low back can also be a cause of sciatica. These muscles can weaken over time or spasm due to strain causing pain, weakness, numbness or tingling that travels down one or both legs. 1. Apply ice – Many find considerable relief from applying ice to the low back to relieve sciatica. Ice works to reduce inflammation and swelling thus providing relief. Apply ice for 15 minutes every 2-3 hours as needed. 2. Watch your sleep – Sleeping on your back is best providing the least amount of stress on the low back. Make sure that you put a pillow under your knees to relieve pressure in the low back. But if you sleep on your side, make sure to place a pillow between your knees (with your knees slightly bent) in order to relieve pressure off your low back. 3. Take NSAIDs – Non-steroidal anti-inflammatory drugs like ibuprofen can be taken to reduce swelling in the low back. By reducing the swelling, more space is created in the back and legs, thus taking pressure off of the nerves. 4. Stretching – A simple stretch to help maintain mobility and decrease pain in the low back and legs is to simply lay on your back and bring one of your knees up toward your chest. Typically, you will hold your leg in place just below your knee. But if you have knee problems, you’ll want to hold your leg behind the thigh. Hold this position for a count of five and then slowly release this leg back down to the bed and repeat this stretch with the other leg. This will stretch your lower back all the way down to the back of the leg. Do 5 sets of these – 2 times a day. 5. Nerve Flossing – Start this exercise by sitting on a surface that is high enough to allow your feet to dangle without touching the floor. First look down with your chin placed against your chest. Subsequently, point your foot and toes (on the affected leg) down toward the floor. Hold this for a few seconds. Next, bring your head back looking up at the ceiling. Subsequently, extend your lower leg out in front of you while pointing your foot and toes (on the affected leg) up toward the ceiling. Repeat this back and forth action five times. This exercise helps to move or “floss” the sciatic nerve and releases it from the impingement in the low back and helps to reduce your pain. 6. Watch your posture – A lot of sciatica pain experienced in the general population is caused by bad posture while sitting. Many people will sit in a “lazy” position with the back rounded and with a lot of unnecessary pressure placed in the lower back from being in this slumped position for long periods of time. It is better to sit upright with your back scooted back into the back of the chair and your shoulders up and back slightly. In addition, you want a slight forward curve in your lower back. This is the most ergonomically correct position for your back to be in while sitting that will allow you to sit for longer periods of time with minimal stress on the lower back. 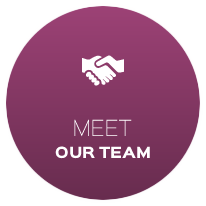 Being a multi-specialty clinic, there are many ways that we can treat sciatica in our clinic. 1. Chiropractic adjustments – Adjustments are able to normalize imbalances in many joints of the body including the low back and thus release pressure off nerves causing your sciatica. Often times, more than one adjustment is necessary to stabilize sciatica, but many find considerable relief after the first adjustment alone. c) Strengthening – specific exercises can be given to strengthen weak muscles, thus restoring muscular balance to the lower back. d) Axial decompression – This is a specialized form of treatment typically for the treatment of disc bulges or herniation in the low back. The patient is placed on a special computerized table that gently and slowly distracts the spine over a 30-minute session. The action of the distraction creates a negative pressure or “vacuum” effect that draws the disc material back inside, thus getting pressure off of the nerves that are being compressed in the low back causing sciatica. 3. Acupuncture – Acupuncture is an ancient healing art started in China over 4000 years ago. The premise of acupuncture is based on meridians (or pathways of energy) that run throughout the body. When a practitioner of acupuncture places needles into the body, they are placing those needles on key points along those meridians in order to manipulate that energy in order to promote healing in the body. Acupuncture is very effective at treating sciatica and restoring overall function to the body. Sciatica is the most common condition that acupuncturists treat. Research has shown that it is over 80% successful with cases of sciatica. 5. Massage – Often, the pain, weakness, numbness or tingling of sciatica is the result of tight muscles. Or sometimes the tight muscles might result from having the sciatica. Either way, sciatica can be relieved with massage by relaxing muscles, increasing blood flow to help speed healing and flushing out toxins in the soft tissue.